Being the epitome of elegance and femininity, Gucci Première is a scent that truly complements the Gucci parfums portfolio. The fragrance bursts into life as the ultimate celebration of success. The base note is just delicious. I love this fragrance, it's warm tones are delightful. 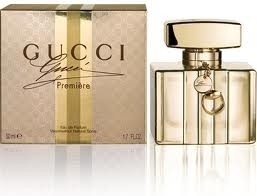 I find Gucci fragrances a little over powering but I like this one. The scent is never too sweet or too girly. I like that it's long-lasting and complex. You only need a few squirts and it last hours. It is more of a winter smell, I wouldn't wear it on a sunny day. Pleasant, but a bit disappointing. Stunning bottle. A pleasant floral fragrance with warm, but light notes of musk. Has a crisp citrus edge which gives it a fresh, uplifting quality. Long-lasting. Quite expensive for such a generic scent. Reminiscent of Boss Nuit for women. Pleasant, but it really is nothing special. A light, fresh and floral fragrance which is suitable for day and evening wear. Not for those who prefer a more distinctive scent. I received a free sample of the Gucci Premiere perfume. I would say it has a grown up fragrance with woody tones, with a musky hint to it. I am more of a floral fragrance person, but this is not unpleasant. I am not sure I would swap from my usual brand though.